27-Dec-2017 -- This is the 3rd out of 11 reports reaching confluence points during our two-week trip through southern Brazil and eastern Paraguay. The story starts at 23°S 46°W and continues from 22°S 45°W. The itinerary and additional pictures can be found here. On our way to Belo Horizonte we passed by this confluence on the main highway number 381 by just 2 km. On minor tracks we got up to a distance of 300 m and decided to park the car there. We continued the track up to a distance of 100 m. Then we entered a coffee plantation, hiked downwards until we found the confluence right at the edge of the plantation. 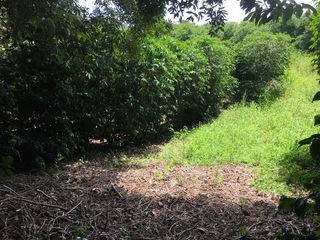 The coffee grows in rows with a grass cover inbetween. At the time of our visit, the coffee beans where not yet ripe. It was a pleasant, short, but hot visit. The whole visit took 25 minutes until we continued our trip to Belo Horizonte. The story continues at 20°S 44°W.